The ‘armchair-generals’ from left to right are: Paddy Green (Napoleon), Richard de Ferrars (Lord Hill) and Carwyn Savins (The Prince of Orange). Martin Small (Marshal Ney) is just out of shot and Mark Davies (Wellington) is behind the camera. 2. The Duke of Wellington and his staff observe French movements from the centre of the Allied line. 3. The Allies are drawn up along a low ridge straddling the Charleroi-Brussels highway. 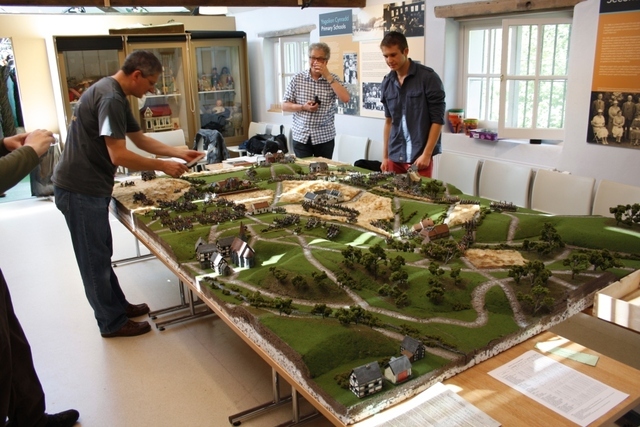 Forward of the ridge are three fortified farm complexes, which will serve to obstruct any French assault on the Allied lines. In the west (foreground) is Hougoumont, in the centre is La Haie-Sainte and in the east (distance) is Papelotte-La Haie. 4. Another view of Hougoumont, as seen from General Picton’s position on the ridge. The regimental colours of the British Foot Guards make a brave show. In the foreground, the Light Infantry of the King’s German Legion prepare to defend La Haie-Sainte. 5. A view of the Allied centre. Nearest to the camera stands General Picton’s 5th Division, with Bijlendt’s Netherlands Brigade, in a somewhat exposed position in front of the line. On the other side of the crossroads is Alten’s 3rd Division, with the bulk of Lord Uxbridge’s Cavalry Reserve Corps. 6. Our local hero, Lieutenant General Sir Thomas Picton stands resplendent in a distinctly non-regulation frock coat and top hat, while brandishing a brolly. A tough, extremely capable and proven commander, Picton was Wellington’s second-in-command at Waterloo though was suffering the effects of two ribs, broken by a French musket ball at Quatre Bras two days earlier. Historically he was shot through the head while leading a counter-attack, though he would survive our battle, despite the near-destruction of his division. 7. On the Allied right, we again see Alten’s 3rd Division, with Clinton’s 2nd Division, Kruse’s Nassau Contingent and several British and German cavalry brigades in support. Mitchell’s Brigade (detached from the absent 4th Division) is stationed west of Hougoumont and Chassé’s 3rd Netherlands Division is on the extreme right flank. 8. The time is now 11.30am and the ground has finally dried out sufficiently, following the night’s heavy rain, for the guns to open fire without burying themselves in mud. 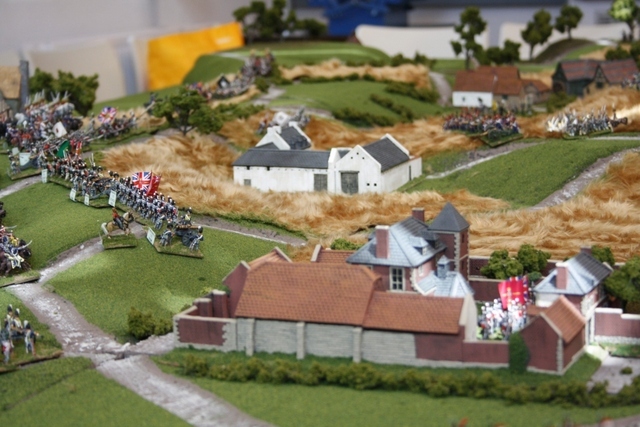 The Emperor Napoleon (just visible on his white horse, next to the inn of La Belle Alliance) watches as his Grand Battery opens a devastating fire on the Allied centre. 9. The astonishing weight of fire from the French artillery quickly silences the Allied guns stationed along the eastern half of the ridge. Picton withdraws to the relative safety of the rear slope. Perponcher’s Netherlanders meanwhile, are quickly driven from Papelotte-La Haie. The French surge forward to attack the weakened Allied left. 10. As the infantry of General d’Erlon’s 1st Corps advances through the corn, the armoured Cuirassiers of Milhaud’s 4th Cavalry Corps gallop forward. Galloping with them are several horse artillery batteries, who move forward to engage the Allies more closely. In the distance, the Emperor waits with his massive reserve (Lobau’s 6th Corps, Kellermann’s 3rd Cavalry Corps and the three infantry divisions of the Imperial Guard) to see what develops. 11. 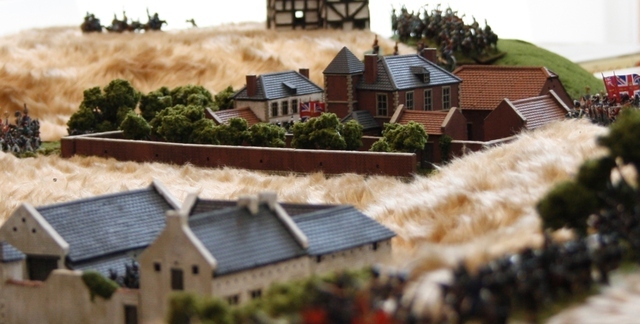 In the west, General Reille decides that Hougoumont, defended by the British Guards, is simply too tough a nut to crack and instead decides to isolate and by-pass that particular fortress. 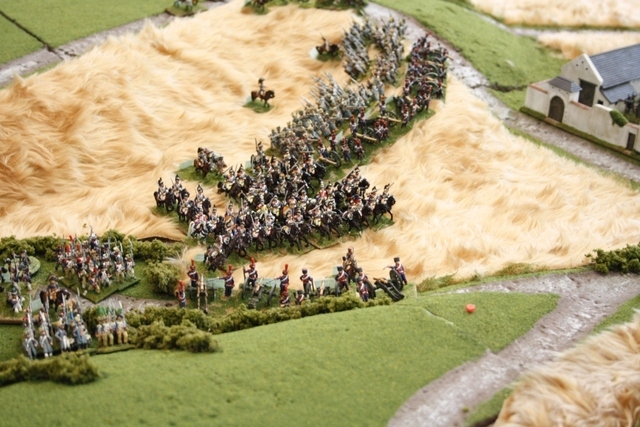 He orders Prince Jerome Napoleon (the Emperor’s brother) to mount a diversionary attack, along with Piré’s cavalry, around the western flank of the Allies. 12. 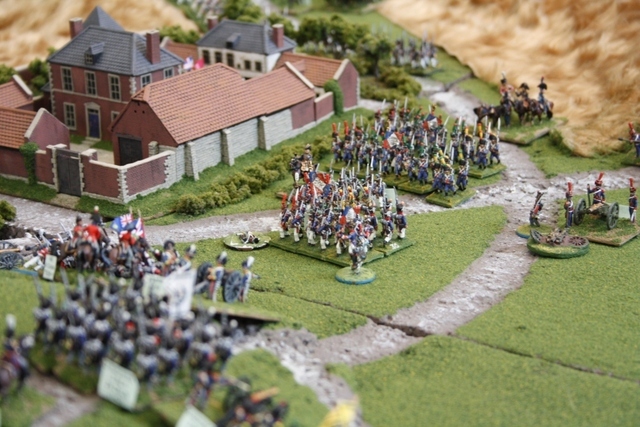 Chassé’s Netherlanders move forward from Braine-l’Alleud to support Mitchell’s beleaguered brigade. 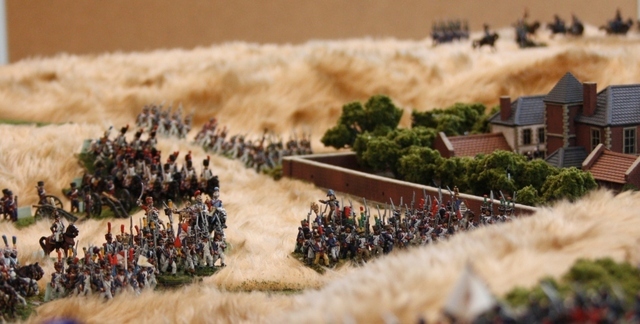 They feel secure on their hill, though their confidence is soon shattered by Piré’s lancers, who break them with ease! This French attack succeeds in drawing Allied reserves right, when they would have been more useful on the left! 13. 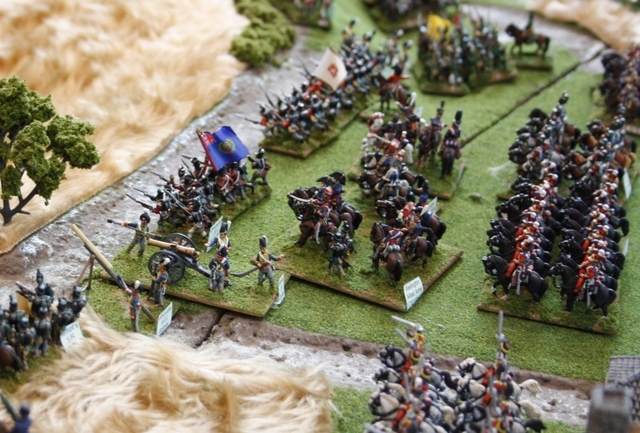 As Picton withdraws from the crest of the ridge, Milhaud’s Cuirassiers surge forward! The Grand Battery also now turns its attention to the isolated German garrison of La Haye-Sainte. 14. 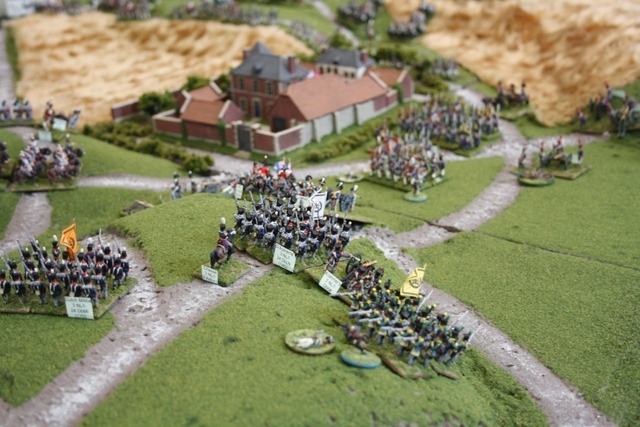 One of Picton’s brigades (Kempt’s) suffers heavily from the French artillery fire and starts to waver. Seeing an opportunity, Milhaud orders Wathier’s Cuirassiers to charge! 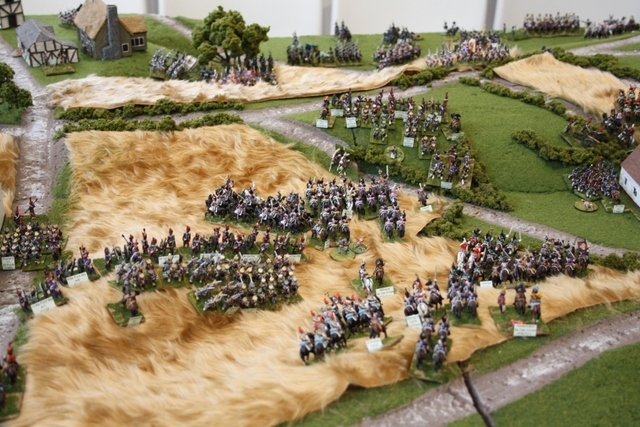 In reply, Ponsonby’s ‘Union Brigade’ of Dragoons (represented here by the ‘Scots Greys’, which was one of the three regiments present in the brigade) launches a counter-charge. Regrettably, Ponsonby’s men suffered a storm of shot and shell from the keen-eyed French artillery and are sent reeling back to their own lines. 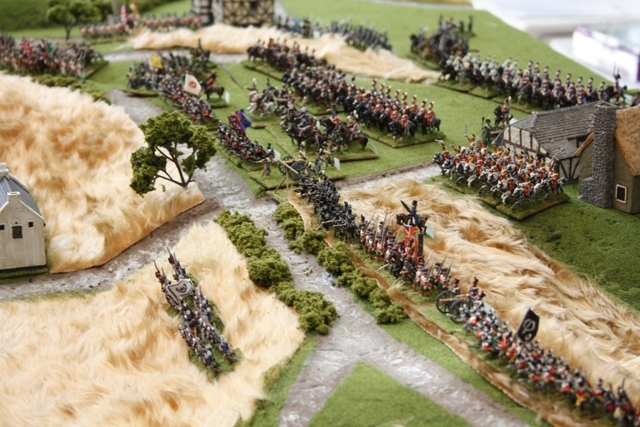 The jubilant Cuirassiers scatter Kempt’s infantry and charge on, almost capturing Wellington himself! Their rampage is finally halted by Somerset’s Household Cavalry. 15. 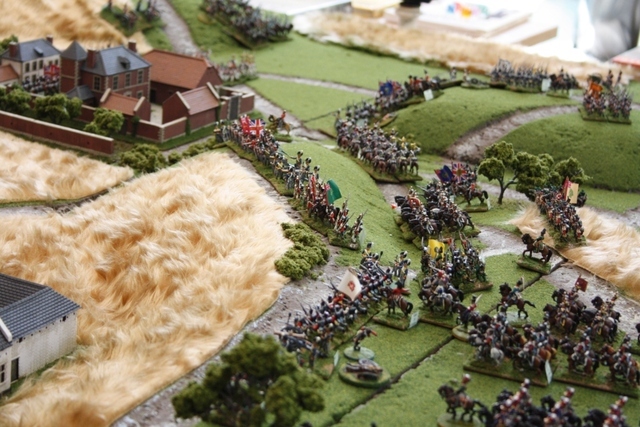 Unrecorded by our camera, the French Guard Light Cavalry Brigade also had a field-day on the extreme eastern flank; they sabred and lanced their way through two brigades of Hanoverian militia, two British light cavalry brigades, three horse batteries and the entire Netherlands Cavalry Division before retiring back to Papelotte. 16. 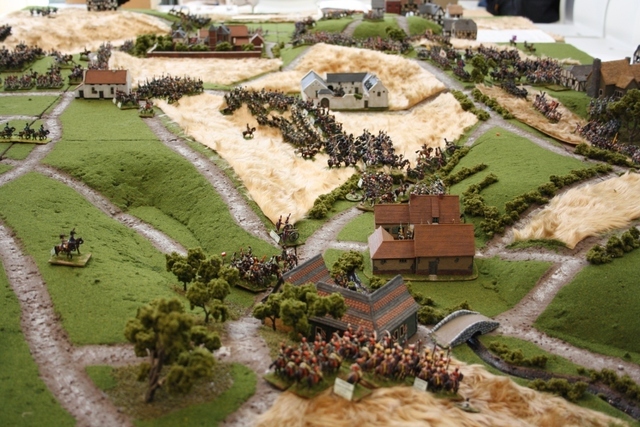 Unperturbed by the collapse of their allies on either flank, Lambert’s British brigade stands like a rock in the midst of the unfolding disaster. 17. 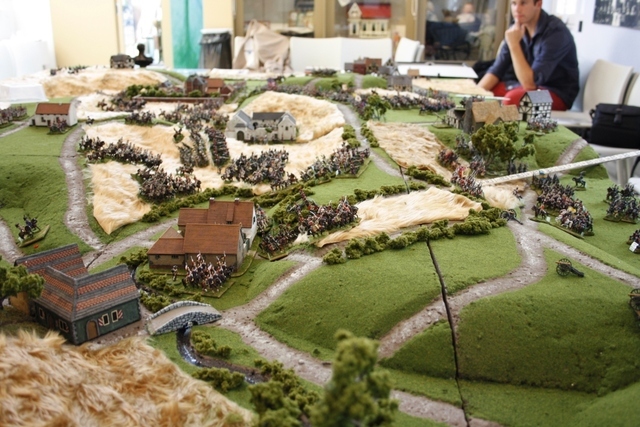 The situation as seen from the French side; In the foreground, Kellermann’s 3rd Cavalry Corps is moved forward to exploit the success on the French right. In the distance, the survivors of Picton’s 5th Division and Perponcher’s 2nd Netherlands Division rally near Mont St Jean, while the ‘Black Brunswickers’ move up to hold the line. 18. 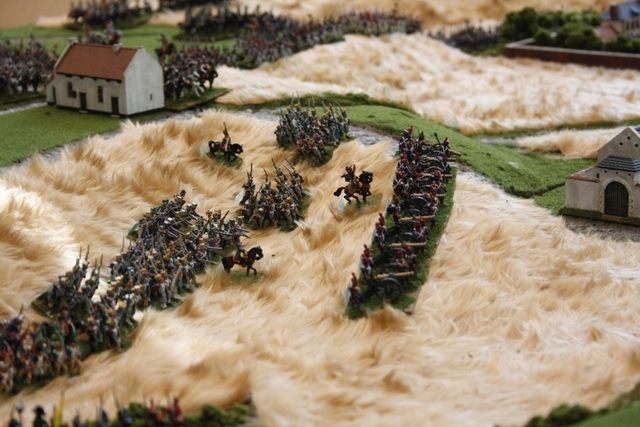 As if things couldn’t get any worse for Wellington; a huge cheer erupts from the French as La Haie-Sainte falls! 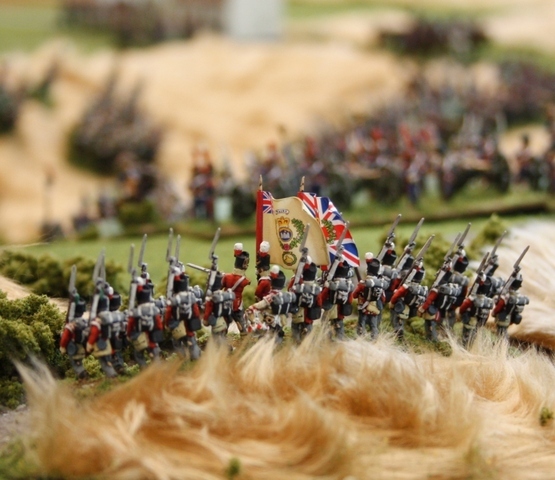 However, Napoleon has now received reports of Marshal Blücher’s Prussians marching to engage his right flank! However, they are still some three hours’ march distant and he is confident that he can break Wellington first! 19. Despite the deteriorating situation on the Allied left (and still no sight of Blücher’s Prussians! ), the Allied right remains 99% intact, with considerable reserves that could be moved to support the right. 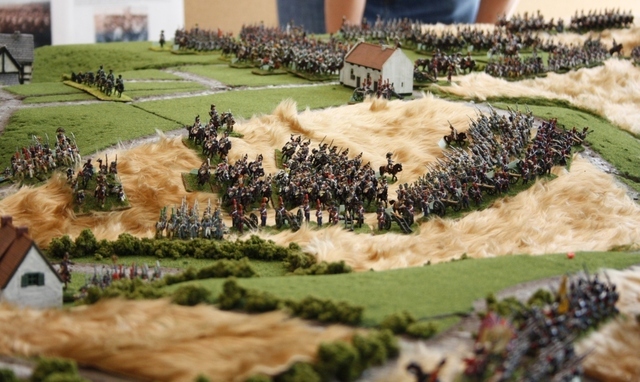 However, Napoleon anticipates the danger and orders Marshal Ney forward with 6th Corps to assault and pin the Allied right. 20. 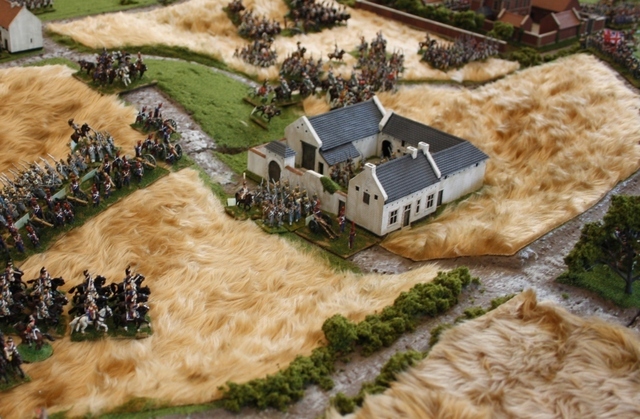 In the foreground, Foy’s uncommitted French division continues to threaten the Guards in Hougoumont. the rest of Reille’s 2nd Corps meanwhile moves around either side of the farm to join Ney’s assault on the Allied right. The Imperial Guard meanwhile, polish their best uniforms in preparation for tomorrow’s victory parade in Brussels. 21. The time is now 2pm. 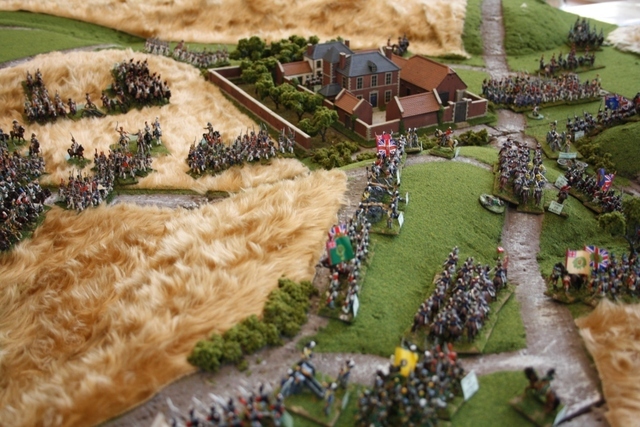 With his left in danger of collapse and with still no Prussians in sight, Wellington considers his options: With the bulk of the army still intact, he could mount an effective rearguard, allowing the army to withdraw on Brussels and then to evacuation at Antwerp, should that be necessary. The other option is to continue the defence, at ever-increasing cost, in the hope of relief by Marshal Blücher. If relief does not arrive, the army will surely be destroyed… What to do…? 22. 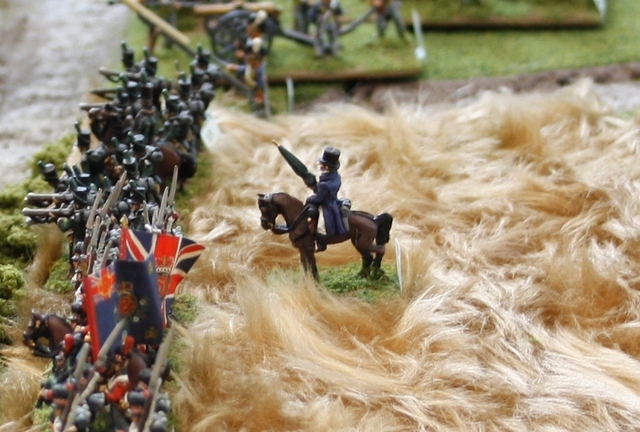 Sadly, time for our re-fight of Waterloo had run out and we could only speculate what might happen next. 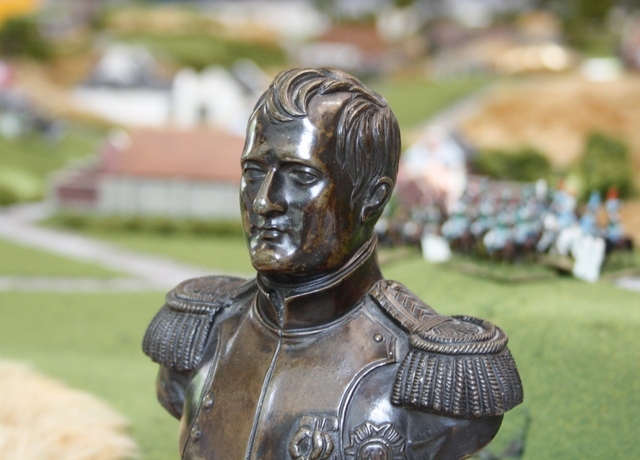 But for now, The Emperor Napoleon was master of the field of Waterloo! 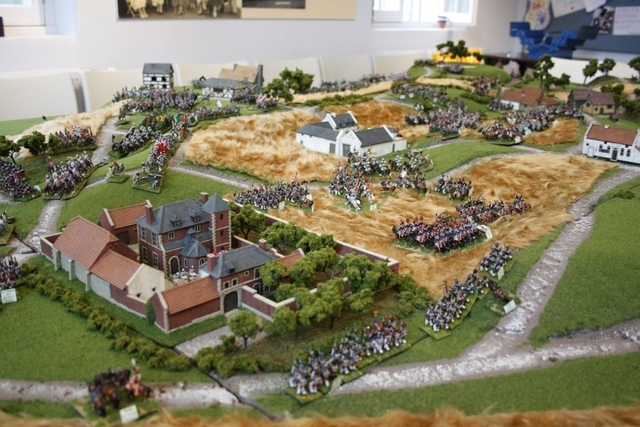 This entry was posted in Napoleonic and tagged Napoleonic. Bookmark the permalink.